"As a day at the seaside stretches before her, a girl savors the beauty around her through each of her five senses-from the salty drops dripping down her face and the shrieks of gulls to the glistening look of tide pools and the squishy feel of wet sand. Sonia Amador speaks with the wonder of a girl who is exploring the beach she loves so much. On both the English and Spanish tracks her enunciation is distinct. 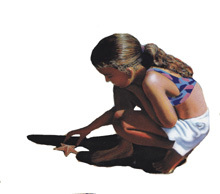 With deliberate pacing she lets listeners sense each of the girl's experiences throughout her beach day. Gentle sounds of water and shorebirds provide background."